I'm sure many of you watched the US Open last week and noticed Martin Kaymar just ran with the thing, won my eight strokes. And you probably noticed that as he's warming up, he was doing a drill with a tennis ball. Today I'm gonna go over this tennis ball drill with you, talk about how it can help you to get a bigger shoulder turn, create a wider arc, both of which are gonna help you to get more speed in your gold swing and also help those of you that are bending your left arm at the top of your swing. We're gonna help you to keep that straight and get some overall better fundamentals and better distance. If this sounds like something you'd like to do, this video is perfect for you. Okay. First to get started, let's go ahead and lose the club. I'll talk about how we get set up with this first. I'm just using a basic lanyard. This would be the ... I think this is from when I went to Bayhill this year and this had a pass on it. And I actually just hooked a paper clip. Cut a couple holes in the tennis ball, hooked a paper clip through there, and a rubber band. So it's actually a little bit stretchy and you can adapt the distance, make it a little longer or shorter depending on how you pull it with your forearms. And from here, you want this to hang about to your belt buckle. So we want that to hang down, hit my belt buckle. If it goes too low then it's obviously going to be below our hands, and if it's too high, our forearms won't be able to reach together to grab the tennis ball. So you want to make sure that it's just above your wrist, maybe three inches above your wrist would be ideal for this. Now, the one thing that I've noticed when I first started to do this drill and I've seen other people try to do this drill, is you want to make sure ... Excuse me ... That you don't round your shoulders forward. The tendency is to really get a good grip on this tennis ball. You try to get your elbows close together. And then watch what happens when I do this. Watch my shoulders. They tend to round forward and my upper back is really curved. I want to try to limit that as much as I can. So I'm going to keep my shoulders down and back, and just let my arms come together to grab the tennis ball. I don't really want to have all that tight of a grip on it. As I'm doing this, I'm gonna feel like my shoulders are down and back, and I'm just barely pressing on this tennis ball. Your shoulders will have to round forward just a very small amount, but again, we're gonna try to limit that as much as we can. So that's the proper set up. Now let's go ahead and do a step-by-step through this entire drill. Now you can go ahead and pick up a club. What we're really trying to do with this drill, is we're trying to maintain some width. So this is going to be pinched between our forearms and we're gonna maintain width as we go into the back swing by keeping a wide arc and keeping my arms very, very straight. We're only gonna be able to keep the tennis ball between our arms for about the first half of the swing to three-quarters of the swing, depending upon your flexibility. The real key for this is you really want to make sure that you only go as far as you can go. So if you're very, very flexible, you'll be able to go back a little farther. If you're not very flexible, you won't be able to go back quite as far. You're not trying to strain and stretch into positions that you can't naturally get into. You're just trying to do the best you can given your flexibility. Now what I want you to do ... Let's actually ... We'll set this club down for one more second. Now I want you to go ahead and grab this ball between the forearms, as we did in the first part of this video. And all I want you to do is turn back as far as you can, again as I mentioned, without really straining. All right, so both my arms are straight at this point. This would be an extremely wide arc, so I'm creating a very wide arc when I'm going back. The bigger the arc you make, the more distance you can get. I'm going to do this a couple more times. Bigger arc. And you'll notice that this lanyard and this string is really being stretched out. It's not hanging loose like this. If I let that hang loose, that's usually indicative that my left arm is bending down. And now you can see that this is really, really loose and my left arm is breaking down. Again as I mentioned before, we want to go ahead and keep both arms straight, really get a lot of turn here, and then keep a little bit of tension on this lanyard. It may be hanging slightly loose, but we want to keep it fairly tense. That's gonna force me to rotate my shoulders. And if you notice in this drill, as I'm doing this, it's a hell of a half back swing. Look how much my shoulders are turning here. I want you to go ahead and do this probably a hundred times to get really comfortable with this and to not feel like you have to force it, but you just let it happen nice and relaxed as you're going back. Now as we add the club, we're gonna move through this position. As we go a little farther back, the tennis balls is gonna fall out and then we're gonna swing on through. So let's go ahead and add the club now. Same thing. I'm gonna set up. I'm gonna do a few more reps just practicing my takeaway of the first half of the back swing. Here we go. That's about as far as I can go keeping the tennis ball in. There we go. Notice that I had a big full shoulder turn there. Same thing from down the line. Get that tennis ball in. Big full shoulder turn, we're going about half way back, three-quarters of the way back. And then from here, we're gonna go ahead and swing all the way back and through. And again, that tennis ball will fly out as you complete the back swing and start the down swing. I'm gonna go ahead and do one face-on so you can see it from this angle. Now as I'm going back keeping both those arms very straight, good full shoulder turn, big arc. There we go. And swing on through. So practice that. It's going to help those three key areas. Do as many, many reps without a club or without making a full swing. Get that good full shoulder turn. Keep both those arms straight so that you make that big wide arc as you're going back. And then from there, go ahead and swing all the way on through. That's really gonna help you in those three key areas. Good luck to you guys and good luck improving your distance. All right, so for those of you who are Premium Rotary Swing members, there's a couple videos I'd like for you to watch that go hand-in-hand with the tennis ball drill. The first one is the Wide-Narrow-Wide drill. Now, the wide-narrow-wide drill, we talk about making a wide arc with the arms, just like we did in this video. We're gonna narrow that up in the down swing. And remember, when that's happening, most of that's happening from the wrist angle. So our arms are staying fairly wide throughout the swing. There will be some bending of the right arm to create that piston action, but we do want to keep an overall wide swing shape and get most of our lag from our wrist. The second video I want you to watch is the Bucket Drill and that's in the Takeaway section. And that goes over almost exactly what we're doing here, except the advantage of the tennis ball drill is you can hit some golf balls while you're doing this. But we're moving the torso, the arms, the chest, all this is one unit, just like in the bucket drill. So that would really help to engrain and give you a different feel of exactly what you're doing with the tennis ball drill. Now finally, the video that I'd like for you to watch is the Keep The Right Arm Straight In The Back Swing video. Now that's also in the Back Swing section. That's really gonna help you to maintain this width that we worked on with the tennis ball drill. So if you put all three of those together or those three videos plus the tennis ball drill, you're gonna have a great idea of exactly what you should be doing throughout the swing to create a wide arc, create a lot of shoulder turn, and some good speed. Good luck to you guys and good luck with your distance. I'll see you soon. JOIN OUR 352,878 MEMBERS AND GET INSTANT FREE ACCESS TO DOZENS OF VIDEOS! 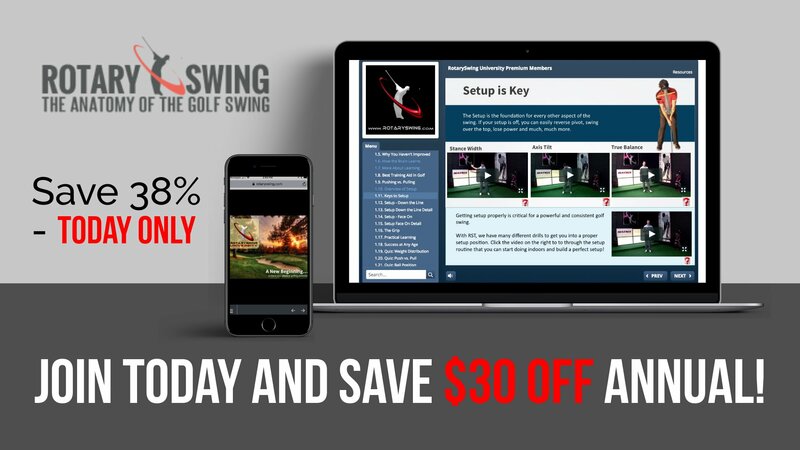 Get Your Free Membership to Finish Watching "Tennis Ball Drill Used by Martin Kaymer" Right Now! Join our 352,878 members to watch this video and 200+ more!